CLASSIC WEEKEND 2015 | What’s Poppin’ Tonight! 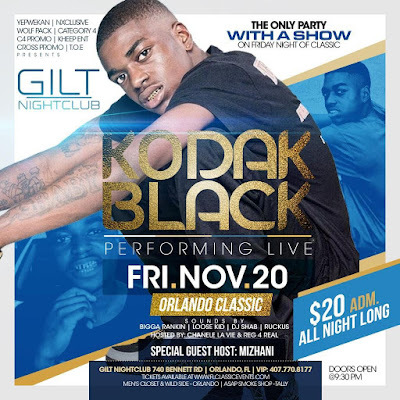 Florida Classic 2015 featuring Kodak Black Performance Live at Gilt Night Club ~ Phresh Hott New! Tonight! KHEEP Entertainment Group | NIXCLUSIVE | YEPWEKAN | CROSS PROMO | NO CROWD CONTROL | CATEGORY 4 presents FLORIDA CLASSIC 2015 Kodak Black Performing Live at Gilt Nightclub. Hosted by Chanele La Vie, Reg 4 Real and Mizhani. Music by: BIGGA RANKIN | LOOSE KID | DJ SHAB | RUCKUS | + MORE…..